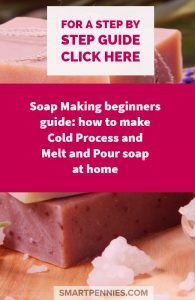 This is a free beginners introduction to what Natural soap making is all about? 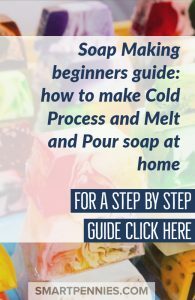 There are two types so Soaps you can make at home Cold Process and Melt & pour so read on if you want to find out more. Manufactured soap is highly processed and does not necessarily contain natural ingredients so if you want to go down the more natural route then making your own Soap can be easy to do and the great thing about it is once you get the hang of it all you will then end up with wonderful gifts especially for friends and family at Christmas time. 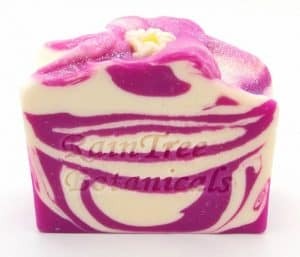 It is very easy to make wonderful homemade lovely scented soap using essential oils which is great if you have any skin conditions. 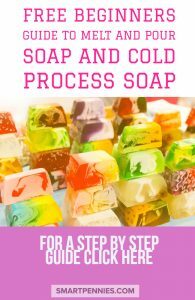 Cold processed soap – this basically involves heating and combine oils with a lye solution ( acidic solution ) to undertake the chemical process called saponification. Melt and pour soap – involve melting premade glycerin soap base and adding perfume and colourants to it to create your own soap this is much easier than making cold processed soap and if you’re starting out it would be a good beginning- this is how I started out both processes can get quite addictive so BEWARE you could end up with a years supply of soap to use! 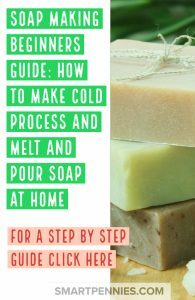 Melt and Pour soap is much easier to make than Cold Process soap and you don’t need to worry about nasty chemicals. In fact, you can even make Melt and Pour soap with your kids. What is Melt and Pour soap base made of? Melt and Pour Soap base is made of ready-made soap base which includes fatty acids, glycerin, and other natural ingredients. Basically, its made the same way as Cold Process soap using oils and lye ( alkali solution of sodium hydroxide and water) with added Glycerin to it and allowed to cure for four weeks. Adding extra Glycerin is what allows you to work with Melt and Pour soap bases but it can also cause Glycerin dew on the finished soap this can be prevented by using plastic wrap. 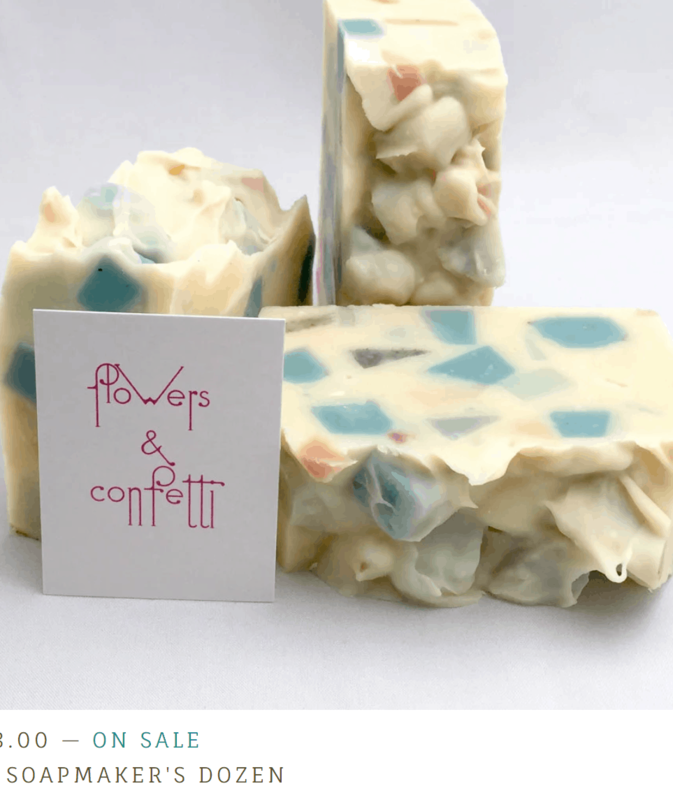 You just cut up the soap base and melt it then add your own choice of scents and colorings and pour into a mold to set. It doesn’t need long to set either and can be ready to use the next day. If you are wondering how much fragrance do you add to melt and pour soap generally its about 0.3 oz. of scent per pound of soap. Essential oils and synthetic fragrances can be used in your Melt and Pour soap base. Mica’s and color blocks are best to use with Melt and Pour soap bases. If you are looking for Mica’s then you can find a fabulous selection at Amazon here are the 5 start review Mica’s. First, you need to dissolve your color blocks or Mica’s about 1/16th teaspoon of powder in a teaspoon in some Isopropyl Alcohol 99% you can purchase it here by clicking on this link. 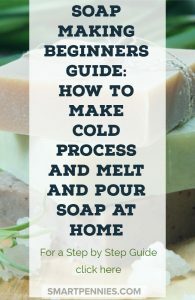 Cut up your soap base into chunks and melt it either in the microwave in short bursts or on the stove top they start melting at around 120 degrees Fahrenheit. Leave the soap to harden and set preferably overnight and de-mold now its ready to use- All you are doing with this step is leaving it to harden. Melt and Pour soap does NOT need to cure. Wrap in plastic wrap to prevent Glycerin dew – You MUST not wrap Cold Process soap in plastic wrap. Firstly you buy the base that you would like to use lots of different companies sell different types of bases. Sodium Lauryl Sulfate SLS is added to manufactured soaps and shampoo’s to make them lather better. Melt and Pour soap bases can contain SLS so if you want a more natural product buy Melt and Pour soap bases without SLS. Here are just a few of the different kinds of ones you can buy depending using various different base oils. These bases have 5-star reviews my personal favorite is from Earth secrets or Saponify. You are also going to need molds and to buy your scents but make sure these scents are safe to be used on your skin. Essential Depot has both Essential oils and Fragrance oils and I highly recommend them especially for purchasing bulk carrier oils and lye when making Cold Process soap which I will go into later. If you are looking for some resources how about these great books from Amazon both have 5 star reviews. If you want to add some extra oils, for instance, Shea butter it is possible but you need to add them with caution. The best guide is to only add about a teaspoon per pound of your Melt and Pour soap base. If you add too much you can affect how the soap base works and your soap may not turn out nice. 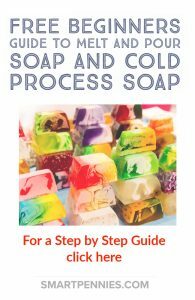 Cold Process soap is made from oils and a lye solution ( water with sodium hydroxide) in a certain combination which will cause a process is called Saponification to occur. This turns the oils into soap with most of the reaction happening within the first 24 hours. Once you have poured the soap into the molds and left it for 24 hours you then take it back out the molds and leave it to cure for at least four weeks. If you add Stearic acid at 0.5% of your total oil content it can be used as a hardening agent and will speed up trace- Trace is when you stop mixing the lye and oil mixture and add it to the molds. Sodium Lactate is a liquid salt you can add to cooled lye water it will help to harden your soap more quickly and make it easier to unmold from the molds. To be honest I have never needed to use it to harden my soaps as I tend to use oils that are solid at room temperature as a majority constituent to my own soap recipes. One of the best places to buy your lye supplies is from Essential depot they sell high quality ingredients made in the USA and at really competitive prices. Essential depot also have a great selection of Essential oils and fragrances which you can also find by clicking this link. 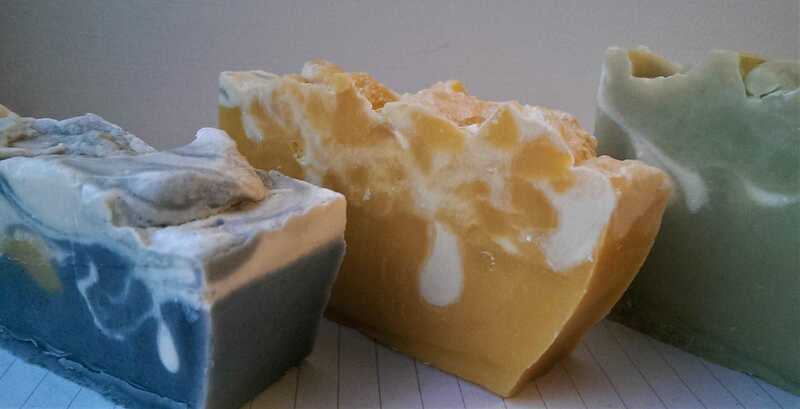 These are some of my own cold processed soap – using natural colorants and essential oils for scents. 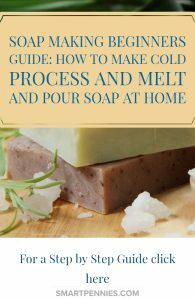 I have been making my own Cold processed soap for over ten years now and I tend to make soap a couple of times a year which lasts my mother and myself ( she loves my soaps) for the year. I give tonnes away as presents and I am always asked if I can make more for friends. 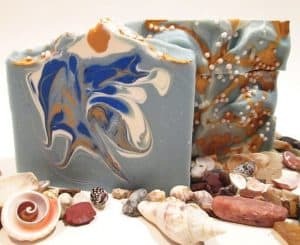 Homemade soap also makes great presents for people so if you want a personalized gift its great to make with their favorite colors and scents. It’s also nice to buy cold processed soap from folks making it as a business to try out different kinds of scents and color combos and see what other people are making. 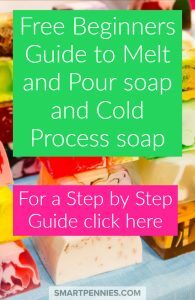 How about buying a kit for making Cold Process Soaps to get you started? From GlowBodyandSoul this is the most amazing soap it has all natural ingredients in it and just looks beautiful! It also gives you great inspiration if you want to make something similar. If you don’t mind synthetic fragrances and colors then it is another gorgeous option from Raintree botanicals. 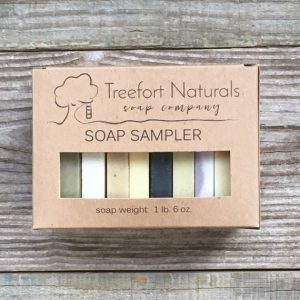 If you are wanting to go with something completely natural then Treefort Naturals is where you want to try. and Last but not least if you want not just soaps Falls River Soap Company have been around for a while and do fantastic products including handmade natural soaps. 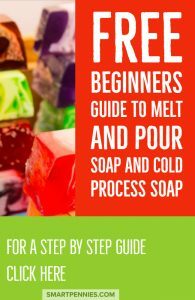 If you are looking for ebooks and books and want to try out a freebie course have a look at thenerdyfarmwife she has a lovely FREE mini email course on staring soap making for absolute beginners – try it out it won’t cost you a penny. 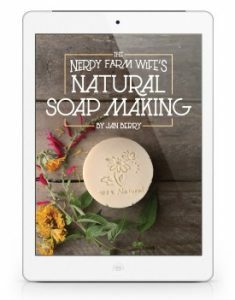 The nerdyfarmwife also has ebooks and course which would be great for beginners as well. Anne-Marie has made a business out of soap making and her tutorials are fantastic. I discovered her a few years into my soap making experiments. 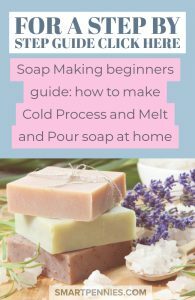 She has some great tutorials on more advanced tips for soap making for creating decoration. I also recommend you check out her Youtube channel Soapqueen tv there are tonnes of videos on soap making. My only caveat with Soap queen is she also uses synthetic colors and synthetic scents which I do not use when I make soap. If you want a truly natural product then you need to use essential oils and natural colorants. Although this is a link to her shop Eden secret makes the most wonderful soap! Eden secrets you tube video– this is a link to her video showing you her drying racks and all her different soaps. The soaps are amazing and some look like cakes! 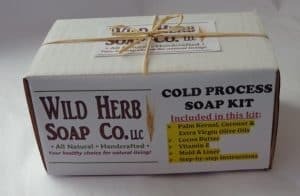 Ok, should have mentioned this when you make cold processed soap you have to leave it to cure for at least 4 to 6 weeks before you can use it. Basically, most of the saponification reaction happens in the first 24 hours after you make the soap but you have to still wait till all traces of saponification happen otherwise the soap can be too acidic to use on your skin. Once its cured it should not be acidic and more a neutral pH – you can use ph strips to test it. Don’t tell anyone but I lick the soap and if it tingles on the tongue it’s still too acidic – yes it does work I don’t recommend you do this unless you know exactly what you are doing! I have been doing this for over 10 years and know if my recipe has worked. If you would love to make soap for a living then the US is the easiest place to do it because it is not really worth it in the Uk as soap here is classed as a toiletry and has to be regulated whereas in the US its classed as a laundry detergent and does not have to be so regulated. Do correct me if that’s changed! I highly recommend her soap its all natural and she uses natural colours. Essential Depot for a great selection at great prices. Soap queen also has a website at brambleberry where you can purchase supplies. If you are in the UK then this is where I get my oils and sodium hydroxide for making cold processed soap. They have always been competitive with their prices and their products have been excellent. Amphora essential oils have a fantastic range of essential oils at a great price and if you can apply for their wholesale account you will save money as long as each order is more than £50. The essential oils are top quality and you can get bulk sizes as well. For unusual products and educational content for making natural skincare as well as soap making resources then I recommend Aromantic. They also do courses as well mostly in making your own skincare. Did I tell you I make my own skincare products as well? It can be very easy to do as well especially if you use just carrier oils as the base for whatever you are making and then add essential oils. If you want to find out more about using essential oils then this is THE BEST book around! It has everything you could possibly need from recipes to explanations of why each oil is used- I can not recommend it highly enough it’s my go-to resources when it comes to using essential oils. If its the one book you buy on aromatherapy then it has to be this one. I highly recommend making your own soap it doesn’t take too long once you get the hang off it and it can be HIGHLY ADDICTIVE! Beware you could end up with so much soap you are giving it away!! It’s so much nicer on your skin than manufactured soap.